one night in bangkok | take your marks. go. You read that right! I’m putting ‘take yourmarks.go.’ back to it’s more original use as a travel blog and write this sat in our hotel in Bangkok. Side note: Happy Birthday to me! We’re here briefly, for one night, before getting the bus to Cambodia: a gruelling 12 hour ride with a land border crossing. Interested to see how that turns out as there are plenty of horror stories out there about the land border crossings. The fact that the bus company we’re travelling with has a complete monopoly on the market as well, doesn’t exactly fill one with hope, but it was too cheap to say ‘no’ to and hey, it’s all part of the experience, right? An early start for us tomorrow – the bus leaves at 5am – we thought it best to take it easy with the sightseeing today and headed in to visit the Grand Palace, check in to the reclining Buddah and pay our respects to a couple of Wats. Spoiler alert: it didn’t quite happen that way. It had been bad luck for Zac all morning, with his shoe deodorant going off in his bag on the plane and melting his razor, to my Aussie hair mask exploding in his trousers packing cube (I was more worried about how much product I’d lost, but thankfully it wasn’t a complete disaster, oh and his chinos were unscathed), but I was filled with birthday joy and wasn’t too concerned. These things happen when you’re travelling, better to get them out of the way with now! We walked down to Mo Chit train station with hoards of fellow commuters on their way to work, minding not to get run over by the impatient scooters and taxis – easier said than done when the motorbike taxis insist on driving on the path as well. Two return tickets to the closest station purchased, we boarded the train, counted the stops and mentally prepared ourselves for the inevitable bartering at the other end to get a Tuk Tuk to the palace. rule number 1: don’t trust the tourist police. We’d spotted some Tuk Tuk’s waiting nearby, but ducked in to a 7-Eleven to get some water and regroup. The gentleman outside looked friendly enough, so we wandered over with the map, pointed to the palace and asked how much. Looking sheepish, he said his English wasn’t very good and miraculously a ‘Tourist Police’ officer wandered over to help us out. Flashing us his badge and credentials he proceeded to ask us about ourselves, where we’d come from, how long we were here for, is it our honeymoon (“Maybe next time, you make it, eh?”), before agreeing a price with our Tuk Tuk driver to take us to a pier where we could get a river cruise while we waited for the Grand Palace to open. At this point is was only 8am, so the palace wasn’t open and to be honest I was intrigued by the idea of a river cruise around Bangkok. Zac wasn’t completely sold and when we arrived at the pier, it was evident that at the very least the driver and the boat owners were working together, but they weren’t malicious and I really wanted to get on the long tail boat for a cruise around the city. I didn’t even have to play the ‘birthday’ card. Trawling around on the boat gave us a unique view of city; people washing their clothes in the river next to fish farms, wooden houses whose foundations were rotting, lopsided and well loved nestled next to ‘new build’ river houses, or at least those with sturdy foundations and a good lick of paint. We disembarked at our first stop and got stung with a 30THB pier fee. Our first taste of ‘business’ in Bangkok, and despite the frustration (we were told everything was included) we hopped off and wandered around the Wat. I wasn’t dressed properly for temples and hadn’t brought a scarf with me to wrap around my exposed flesh, so we settled for a fresh coconut and sat outside the Wat taking it all in. Back to the boat and we were dropped off at the Grand Palace, just in time to be picked out by another friendly, helpful, Thai gentleman who wanted to look at our map and advise us of the best way to spend our time. Conveniently, as he was finalising our options for us a Tuk Tuk driver appeared, who he said for 100THB would take us to see ‘The Black Buddha’ (not many people know about it) and then take us to the Golden Mount and another Wat before returning us to the Palace: I wouldn’t be able to borrow clothes to wear in the palace until after 1pm you see. I can already hear the experienced visitors to Thailand groaning. It had to happen once, and why not on my birthday? Actually, they possibly only got us because it was my birthday and we were trying to fill the day with culture and experience for as cheap as possible. 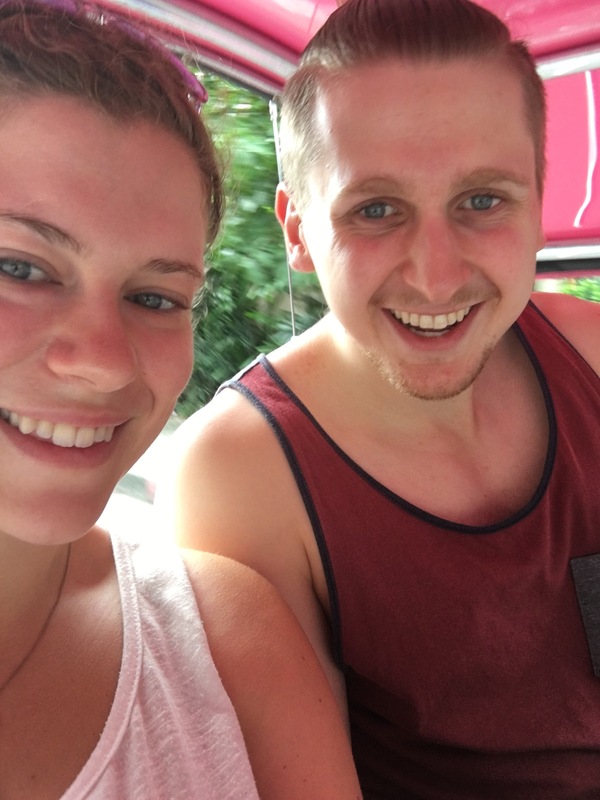 rule number 2: don’t trust the tuk tuk drivers. The Black Buddha is a well known Thai tourist scam, and our driver got an additional 200THB out of Zac, after we’d already arrived at our final stop claiming that he’d bought our tickets for the Black Buddha and he had now had no money for water. Initially I was angry, then frustrated that we’d been had so easily, he seemed like such a nice guy, then sad that in that moment I’d lost all the wonder about Bangkok and was judging people who approached us with nothing but suspicion. Zac could see that it was bothering me, but I couldn’t work out how to explain all that. In the end I flopped down on a bench in the shade and just started to laugh. The amount wasn’t the issue, just the fact that they’d managed to dupe us so easily. I could have let it taint the whole day, but it was funny to think that when we were being blessed with holy water by the monk and being given matching lucky red bracelets (in exchange for a donation to the shrine, of course), revelling in this unique cultural experience, we were being had. We still like our bracelets, though. The best thing was when we got to our final destination and the driver asked us for a tip! Zac then went from one extreme to the other with his bartering, trying to barter a trip back to Siam Shopping Centre for 30THB, reactions varied from “It’s impossible” with genuine amusement to seemingly mortally offending people. We returned from our day unscathed, apart from our pride, and wandered down to the nearest 7-Eleven (apparently you’re never more than 5 minutes away from one in Thailand) to get some more water and a box of Pocky sticks. We’re now attempting to cool down before an evening stroll along to the park, perhaps sampling some of the street food along the way. I don’t know what I expected of Bangkok, and we’ve hardly seen it in it’s potential glory in the short day we’ve been here, but when we come back in December, it’s certainly tainted with an air of scepticism for us. Inevitably we’ll be staying within walking distance of the main attractions if we do stay in Bangkok, but it’s looking likely we might avoid it all together, merely stopping through en route to the nearest island! Despite the frustrations and the scams, I’d say it’s been a cracking birthday.